The Skinny: Stylish action and good production values compensate for the fact that this Andy Lau gangster saga/vanity project is only slightly above-average. Reasonably entertaining, but wholly ridiculous. 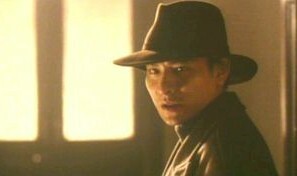 by Kozo: Andy Lau is Cheung Ye-Pang, a righteous police officer who gets sent by the Nanking goverment to affluent Shanghai, cirica 1930. His job is officially to stop the opium trade, which was apparently at insane heights back then. The big problem: it's not just evil businessman Tai Chai-Man (Damian Lau) who runs the opium trade, it's also Police Commissioner Ni Kwan (Gu Bao-Ming). In fact, Cheung Ye-Pang may be the only clean cop in all of Shanghai, as evidenced by his lack of support by the entire city, as well as some higher-ups in Shanghai, who throw more red tape at Cheung than he can possibly handle. Thankfully, he finds a couple of allies who help him the only way they can: busting into known drug smuggling locations and shooting off a couple of million bullets. This leads to over-the-top action sequences, as well as the expected fallout as those in bed with the bad guys (i.e., everyone but four people in Shanghai) attempt to exact their revenge. Eventually many people die, an end not limited to just cannon fodder or innocent passerbys, though many of them buy it too. Tian Di is simply awash with a mountain of corpses. Excessive is probably the best word for Tian Di, a film which takes a noble, historically-set story and fills it up with more bang-up action than your average John Woo movie. Bodies fly, innocents fall, and any semblance of concealing a crime is left on the cutting room floor as the body count reaches dangerously high numbers. The film has an impressive setting and cinematography, and the period detail feels quite authentic. What doesn't feel authentic are the characters in the film, who aren't really characters. Everyone exists as a "type" from a cop/gangster screenwriting handbook. Cheung Ye-Pang is so righteous that he's basically asking for a bullet in the back, and the big crime kingpins are so annoyingly evil that they can commit murder in public places and not arouse any suspicion whatsoever. The evil cops also strain believability; they flaunt their corruption without any care of censure or punishment, and basically invite a too-righteous do-gooder like Cheung Ye-Pang to try to take them to task. When it all comes down to it, Tian Di is just totally ridiculous.